I recently completed The Diamond Dutch by Victor Moskalenko, as the openings component of my current eclectic training program. I found it to be an excellent example of a useful, modern-style openings book focused more on practical play rather than exhaustive theory. As such, it does not attempt to be comprehensive in its treatment of every line of the Dutch Defense; rather, it examines all of the major variations and the less frequently played "Anti-Dutch" lines from the view of an experienced practitioner (on both the White and Black sides of most of the lines), focusing more on critical options. This approach has great practical value and the author is candid about his evaluations and preferences, presenting them with clear, objective reasons (even if not always fully-fleshed out proofs). 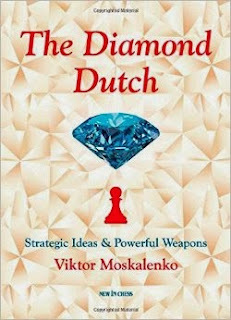 Moskalenko is known as both a player and advocate of the Dutch Stonewall, so it is no surprise that the section on it is both the largest and (in my opinion) strongest part of the book. The author's exposition of common plans in different set-ups, driven by White's primary strategy, is illuminating and particularly insightful, since a lot of the sample games are his own. Rather than try to cover all the Stonewall possibilities, he focuses on what he considers to be the most effective lines from his own practice. As Black, for example, Moskalenko generally avoids an early fianchetto of the light-squared bishop in favor of the more traditional development via d7 (and then to e8 and the kingside, most often). This type of approach contrasts with the more comprehensive treatment in Win with the Stonewall Dutch, which also tends to favor the more modern fianchetto approach. However, Moskalenko is not dogmatic about it and points out places where playing an earlier ...b6 can be good. In many cases, as he does in other parts of the book, he may give one-move "!?" alternatives without further analysis. In other works I've sometimes found that a frustrating practice, but here it made more sense to me, as it gives the reader other possibilities to investigate while helping reduce the complexity of analysis to a manageable level. The section on the Leningrad Dutch is also meaty, if not quite as fully fleshed out. However, in Leningrad theory there is more of a history of busted or now-dubious lines, in contrast with the more resilient Stonewall, so Moskalenko's focus on what he considers to be the critical tries appears appropriate. He also does not neglect things like the move 7...Nc6 in the main line and offers the best recent high-level treatment of it that I've been able to find. I also found his explanations of the problems with the 7...Qe8 line (dropped by most GMs a while ago) and the benefits of the 7...c6 option (the main line these days) to be quite helpful. He also deals well with sidelines that are very important to know in the Leningrad, including some recent ones at the top level such as Aronian-Carlsen (Saint Louis, 2013). Moskalenko's treatment of the Classical Dutch (and transpositional possibilities) is also good, although it is not my particular focus of study and I only looked at a few selective examples. As usual with my opening study practice, I first went through the book using a physical board, then after each section used it as a reference in updating my opening repertoire database. This sort of repetition I find both useful and aesthetically pleasing, as well as overall more comfortable than sitting down in front of a computer while trying to read and input moves at the same time on a first reading. Moskalenko's (now-standard) approach of using reference games for each line, along with other game fragments as references for variations, is also helpful in constructing a more holistic understanding of middlegame and endgame considerations likely to arise from each variation. From my point of view, this is a key book for any serious Dutch practitioner who wants both greater insight into the plans and possibilities for each side, while having the most up-to-date general treatment available on the key lines.